Most people that are from or visit this area with goals of spending time outdoors are very familiar with the Eagle Creek area in the Columbia River Gorge. However, only 45 minutes or so from that site is another Eagle Creek wilderness area. This one is over in the community which also calls itself Eagle Creek, nestled between the towns of Sandy and Estacada. 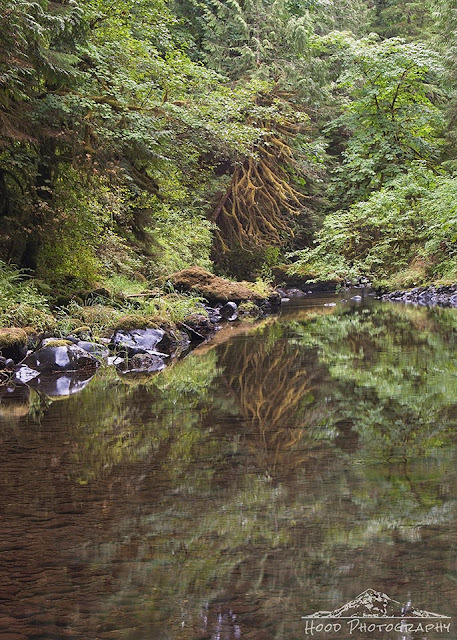 Through much less visited forest meanders this fairly lazy and quiet creek which also bears the name of the area. Nice reflection! Yes, I've hiked at the "other" Eagle Creek and it is a truly spectacular old growth forest. Love the gorgeous reflections. Beautiful. Ahhh, that is a refreshing and calm spot to be. Wonderful photo.